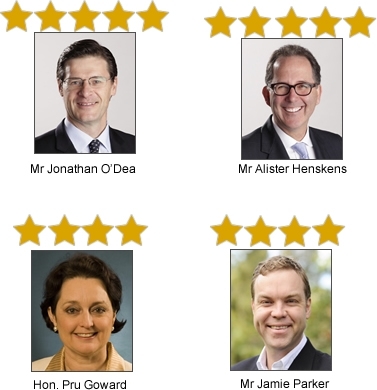 In the past term of the NSW parliament, six MPs have stood head and shoulders above the rest in terms of responsiveness to voters, no matter where they live, on a range of issues. Best responding MP in NSW during the current Parliamentary term was the Liberal Member for Davidson, Mr. Jonathan O’Dea. Second was retiring Liberal Member for Hornsby, Ms. Judy Hopwood. Third was the Labor Attorney General, and Upper House MP Mr. John Hatzistergos. This is no mean feat for a person with ministerial responsibilities. FairGO director, Mr. Greg Bloomfield congratulated and thanked the six MPs saying “ We thank these six Members of Parliament for the exceptional way in which they have responded to voters. If all politicians responded to voters this way, NSW would enjoy very good government." Media Contact: Greg Bloomfield, National Director, FairGO in Sydney on 02 9988 3312 or 0428 417 496.